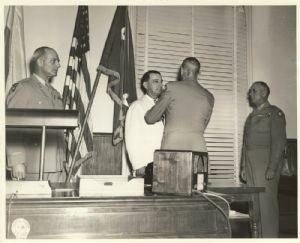 General Jonathan H. Wainwright presenting the Distinguished Service Medal to Major General Russell Peter Hartle. United States. Army, Biography; World War, 1939-1945, United States; Hartle, Russell P.